In the “Balloon Charging Lab”, you will start by rubbing a balloon on a sweater, noticing how the electrons behave as the balloon is rubbed. Once all of the visible electrons are rubbed from the sweater, you can use the balloon to interact with a metal bucket (a conductor), or a roll of paper towels (an insulator). This simulation is designed to show attraction and repulsion between charged and neutral objects. It also simulates transfer of electrons between insulators and conductors. A copy of the “Balloon Charging Lab” activity is available for this simulation. 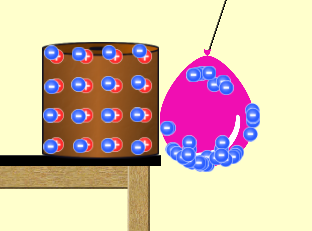 It walks students through several scenarios, and is suitable for anyone learning the basic physics of charged objects. Click on the links below for the .pdf or MS Word version of the lab. That the balloon and sweater is a great example on to show what happen.